There is no doubt that Android is one of the most popular mobile operating systems out there, but is it really a perfect mobile platform. We don’t recommend you ask this question to an Android developer; they’ll give you angry eyes for sure. But hey, even some consumers would do that. And with surprise Android N Preview Build announcement done by the Mountain View Company, all users would want some taste of this latest piece of software. Unfortunately, it’s not available for any other devices except for selected Nexus products. But notorious developers at XDA has figured out the way to access a one little nifty feature that was introduced on the recent Android N Preview Build, it’s the DPI scaling, which lets you change the screen zoom levels. It has been introduced at the system-level on the latest N build. If you have dreamt of selecting those DPI scales according to your needs, then you can do that on the latest Galaxy S7 & S7 Edge. With a neat trick, you can find this hidden feature on the TouchWiz UI based on the Marshmallow. Follow the below instruction to get this feature on your latest Samsung handsets. Note: There is no rooting required to use this feature. Download & Install the Nova Launcher; you don’t have to put it as your default launcher, launch it to access the home screen. Tap and hold on the home screen, then head over to Widget Selection window. You have to choose the Activities widget; drag and drop that widget to home screen. There would be a new icon on your desktop, select that icon to open the menu and make your selection. In the confirmation window, you will be asked to reboot the device. You can go back to your default launcher after the reboot. Samsung offers more feature than any other OEMs out there, and we will criticize their TouchWiz UI a lot, some do it for no reasons. 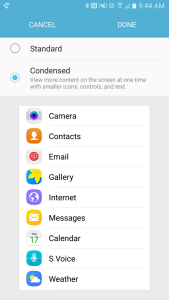 If you are familiar with the features Google added on the Android N Preview Build; then you should know that this is the third feature (DPI Scaling, MultiWindow, and Notification Quick Toggles on top) that has been the part of TouchWiz UI all along. There is one other reason for you to purchase the latest Galaxy S7 or S7 Edge.